Oliver Spencer founded his eponymous label in 2002 and has always made clothing that is seen rather than heard, slowly evolving his concept as and when he sees fit and the right opportunity arises. He approaches everything from a luxury standpoint but then injects functionality to create collections that combine classic English style with hints of Americana and Japanese ideas to consistently dish out a modern sophisticated aesthetic. The hearty recipe of quality fabrics, modern fits, old school construction, characteristic details and exquisite craftsmanship is served in everything and anything he turns his hand to. 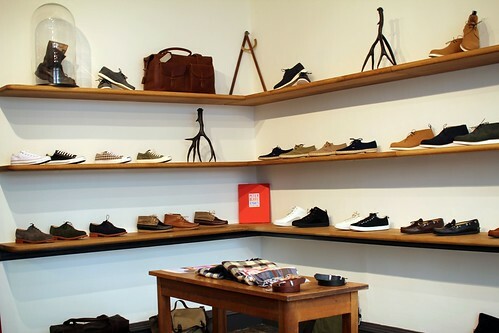 Now, in retaliation to the lack of quality shoe shops for men and with the few that do exist left wanting with regards to the retail experience, Spencer has taken matters into his own hands and opted to expand his empire with the opening of his second store on Lamb's Conduit Street. We've said many times on the blog that strolling down this special street in Bloomsbury feels like a little retail reconnaissance and Oliver Spencer has played no small part in that. SS: What was the catalyst for a standalone shoe store? Oliver Spencer: It stems from the idea of having one foot in the past and the rest of your body in the future. For me, it is all about good old fashioned shop keeping. I sell to all of these fantastic department stores but they all have these huge concession shoe areas. From their viewpoint, the focus is on offering thousands of shoes across a huge area. I wanted to offer an alternative. I was drawn to the idea of offering a different type of shoe buying experience. What happened to the old way of shop keeping? Their just aren't many shoe stores in London and I just needed to open one. 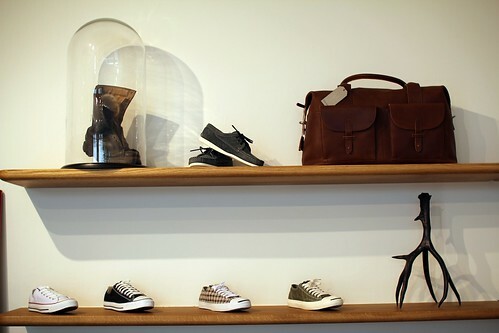 Of course Paul Smith has a few, Lodger has a great store, as does Lobb's and Cleverly in the Bond Street Arcade but they tend to offer quite classic shoes. I wanted a store that was based around proper shopkeeping. Where you have a particular customer in mind and you offer everything from a £55 pair of pumps all the way upto a £250 pair of Goodyear Welted shoes and this guy can buy everything in between. He can start at Converse, go to Vera, Quoddy's and go to us. So basically, I wanted to provide all of the shoe options that our customer would need. Oliver Sepncer: Exactly. 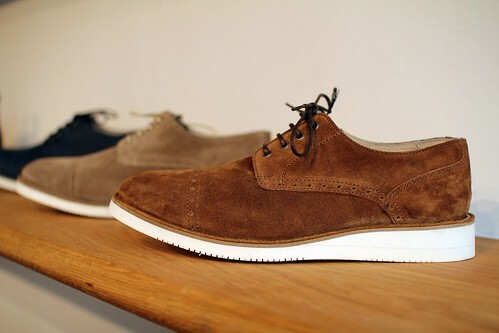 The other thing that I wanted the store to be and again, this is most unlike other shoe stores, is for it to be highly minimal. Basically, the idea was to do everything on a small footprint. Very simple, very straightforward. For example, all of the wood in the store is made in Dorset by a company called by Another Country and it is all so beautiful. I want the customers to be able to go in the store and be able to look at a pair of shoes for what they are and not to be bombarded by so much choice. I got in to partnership with a guy called Simon Spiteri, who used to work at Liberty's and he buys in all of the other products in the store and it has worked very well. SS: Could you tell us abit about the buying process and how you work with Simon Spiteri? Oliver Spencer: The process is hugely collaborative. it was key that Simon understood exactly what I was designing and we both understood who we were making and buying shoes for. We looked very closely at brands, not only what they produce but their price structure as well. Recently someone told me that I was really lucky to have Gourmet in the store because apparently they are quite difficult to get. I just love their shoes. I personally prefer them to Converse but then, Converse have a different pull. 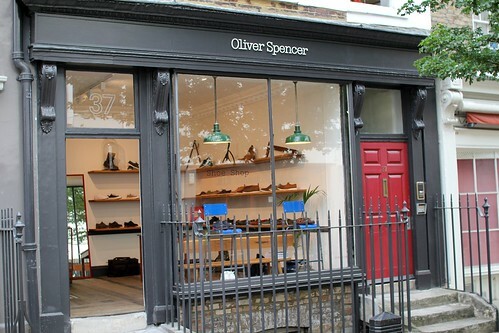 SS: You've hinted at the type of customer that the shop targets but could describe the Oliver Spencer shoe man in more detail? Oliver Spencer: Basically, he is different ages of me. He is anything from twenty five to fifty five. He's eclectic. He buys quality. He's got a mind for it and is in to design. He understands our concept and buys in to what we do. He would kick around in his Converse, go to a meeting in his Goodyear's, holiday in his Quoddy's, he does the whole thing. We've tried very hard to offer everything and anything he could need. Actually, we're currently looking at sandals. Just because there aren't many great sandals on the market. 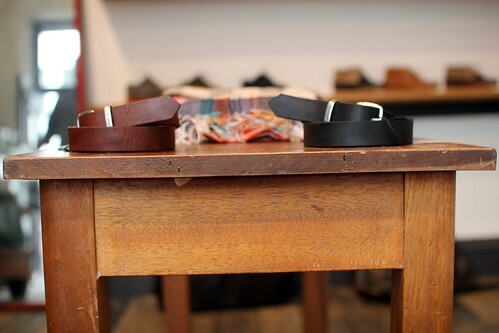 I'm tempted to go back to school with it, to create a school sandal for blokes in the future. Right now though, we are looking forward to Autumn/Winter. This is when proper shoe business is done. Oliver Spencer: With our two own lines, we are looking to cover as much as we can. I will always want to buy in other brands to compliment our own offering though. It is important for us to be both fluid and interesting. SS: How has the reaction been since the opening? 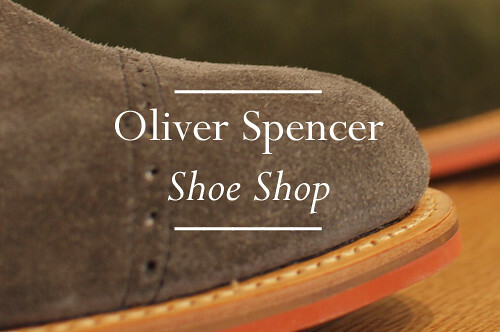 Oliver Spencer: Well, we've been open for two weeks now and we've sold shoes every day. Some days just a couple, others a number of pairs. It certainly feels right and quite exciting. Oliver Spencer: There really does. The street has great community in it, with a mix of local and professional, generally very open minded people. Cathal from Folk was actually the person who recommended the street to me. He just said "Come and open a store, it'll be fine, you'll love it" and he was right. I have never looked back. SS: Since launching the label in 2002, you've slowly grown and added to your offering. 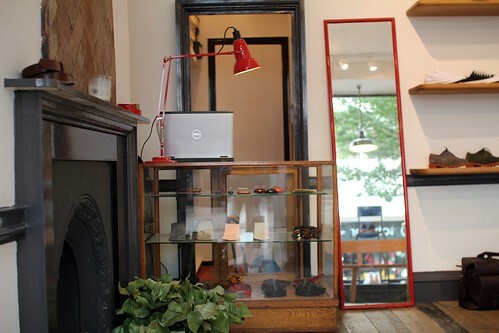 How do you see the shoe shop developing in the future? Oliver Spencer: We are slow and I'm proud of that. We evolve naturally. Things come our way and we work in our way. Nothing is forced. The plan, after this is fully up and running of course, is to open a few more in London, in a number of different locations, Redchurch Street, Berwick Street and perhaps Borough but who knows. Shoes will remain the focal point but we will also offer other products, including gloves and bags. Well picked Oliver Spencer accessories and the latest addition to the store, an old school desk complete with etchings of love, hate and the odd piece of chewing gum. 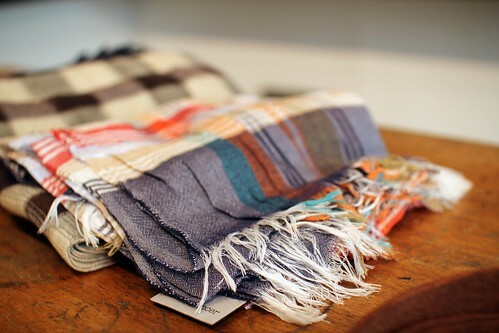 The OSA154 Deck Scarf Multi Check proudly sits on the old school desk. 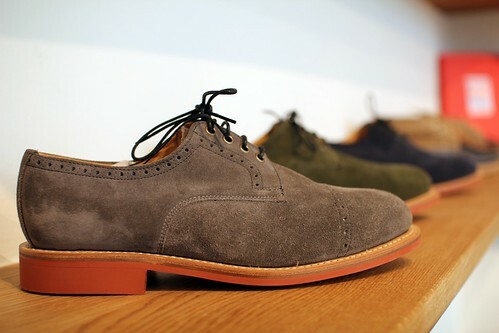 The Portugal made Spencer Cricket Shoe is a lightweight derby style shoe. 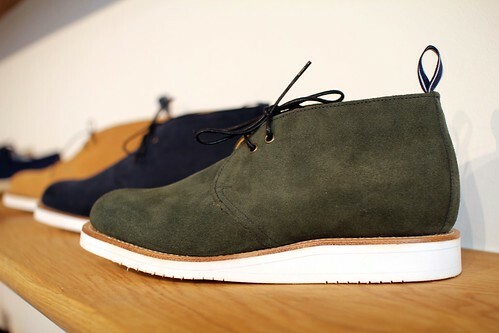 OSA161 Chukka Boot Green Suede. 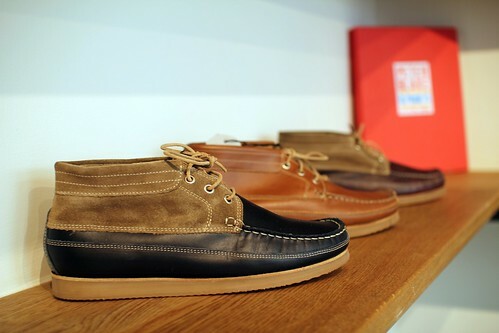 A welcome addition to the summer shoe wardrobe. 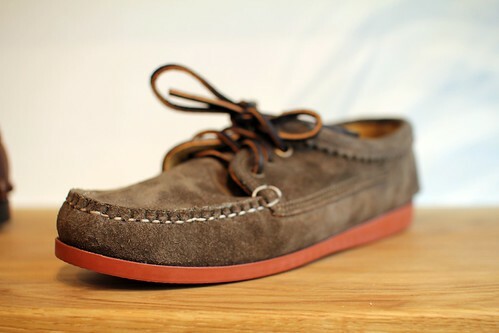 Quoddy's Mushroom Suede Blutcher. 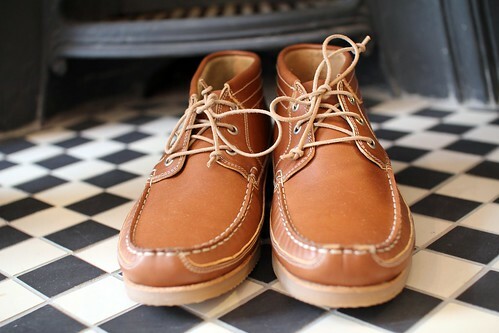 A classic shoe with full moccasin construction. The Spencer Kyak in a beautiful mix of leather and suede. 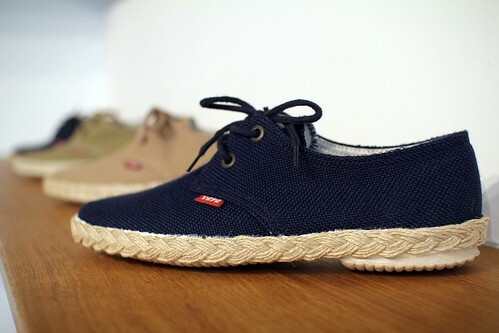 Vera Santander Perforated Canvas is a great take on the Summer espadrille. Gourmet's Uno Lo provides a refreshing change from the basic canvas pump. The Spencer Kyak in front of the fireplace. 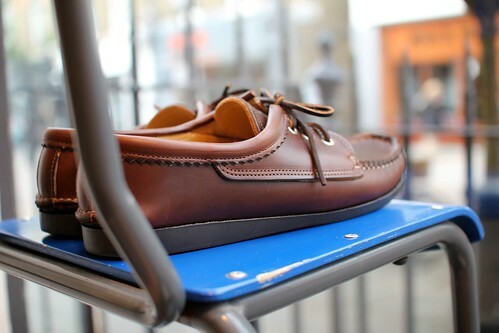 Quoddy's Brown Leather Blucher overlooking Lamb's Conduit Street. 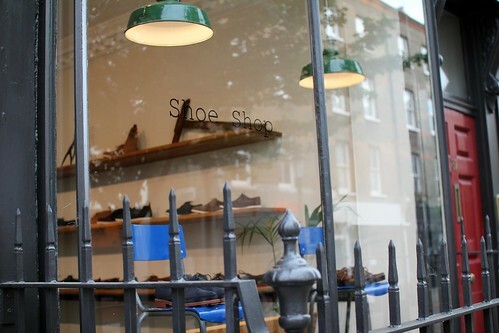 The Shoe Shop is now open at 37 Lamb's Conduit Street. 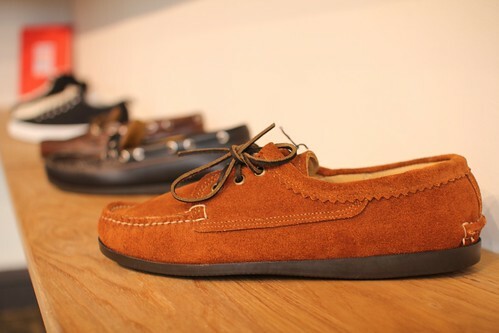 My eyes are directed to Quoddy's Cognac Suede Blucher! If only they had that here in the Philippines..
Looks like a beaut. Olly comes across very well here and the shoes are great. Love the Kyaks. ooh i love those shoes! Hey great idea from a blog, it's nice to see an open appreciation to well tailored mens clothes. my boyfriend;s really into that stuff. I know it's about the shoes, but I spy some scarves and a belt I would be rather interested in getting my mitts on! I really like the shoes, congratulations! Looks like London's retail renaissance (yes I went there) is really gathering steam! Mr Spencer sounds like an old soul and I love how he's really thought about the man who buys his clothing and the shoe's he'd need for any occasion.